Protecting Beloved Pets from Pests - Yes Pest Pros, Inc. Protecting Beloved Pets from Pests - Yes Pest Pros, Inc. The humans in your household are not the only ones affected by pest control issues. Your pets are just as at-risk for pests as you are. Common household pests can be annoying for pet owner but they can be deadly for your pet. Take care of the animals in your change by keeping them free of pests. Some of the same pests that bother you will bother our pets. Fleas, ticks, mosquitos and even bed bugs can affect your pet and his health. Monitor your pet’s bedding and fur to check for bites and bugs that can signal the need for veterinary care as well as a Bloomington pest control expert. Fleas will not only bite your pet but you and your family members, too. Evidence of a flea infestation is easy to find on most dogs or cats. Check their fur regularly, right down to the skin. You will see either live fleas moving on the skin or the “flea dirt” they leave behind. This black, granular dust may look like dirt but it is actually the feces of the fleas. 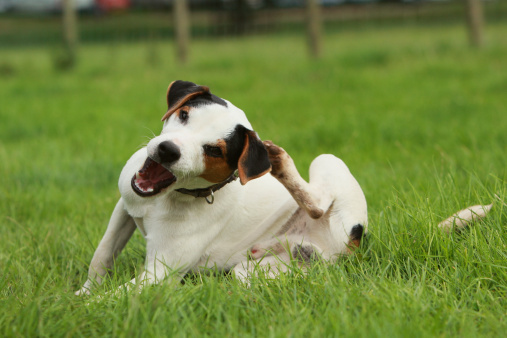 Flea bites will make your pet itchy so look for signs of excessive scratching like bald patches and irritated skin called dermatitis. Fleas can take enough blood from your pet that he can become anemic. Check his gums for a deep pink color. If they are very light pink or whitish, your pet may be feeling quite poorly. Ticks are known disease carriers for Lyme Disease, Rocky Mountain Spotted Fever and several other illnesses in humans. Your dog can contract tick paralysis from them. Marked by muscle weakness, loss of coordination and even respiratory failure, this is a life-threatening condition. Avoid walking your pet in tall grasses and check his entire body for ticks once you return home. Look between his toes and inside his ears in addition to his coat. If you find signs of pests on your pet or his bedding, consult with your exterminator on how to best get rid of them. Some methods can be harmful or deadly to pets so don’t try to tackle it on your own. Protect your beloved pet from pests and you’ll also be protecting yourself.